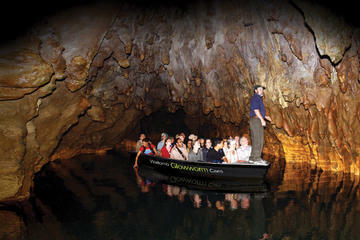 See all the highlights of the Waitomo Caves and Rotorua in one day. Travel by scenic coach from Auckland to Waitomo Caves for a guided tour of Waitomo Caves with its stalactites and the glow worms, before heading onto Rotorua's bubbling mud pools and geysers, make many other interesting stops along the way. At Waitomo Caves, you'll take a guided tour through the long galleries and lofty chambers to view stalactites formed over thousands of years by the constant dripping of water. Your caves tour includes a magical boat ride through the glow worm grotto, illuminated by thousands of glow worms suspended from the cave ceiling. Next stop is the the Agrodome for a hands-on Kiwi farming experience. You'll see sheep mustering by highly trained dogs, sheep shearing demonstrations and receive an insight into the history of dairy farm milking. Don't miss the opportunity to milk a cow, feed young animals or even be photographed with a huge bull! Then it's on to the famous Te Whakarewarewa Thermal Reserve to see the renowned silica terraces, bubbling mud pools and unique geothermal vegetation. Exploding from the ground up to 100 feet (30 meters) high is the world-famous Pohutu Geyser, which bursts into life 10-20 times a day and has been a visitor attraction since the early 1900s. You'll also visit the Maori Arts and Crafts Institute, to see how traditional carvings and weaving record history and customs in the Maori sacred meeting houses. After your Rotorua city sights tour, you return to Auckland. Price includes return scenic coach travel, 2 nights hotel accommodation, light refreshments and lunch, entry and guided tour of the glow worm caves at Waitomo Caves, entrance to Agrodome, Rainbow Springs, Te Whakarewarewa thermal reserve and Maori Arts and Crafts Institute at Te Puia thermal reserve. Accommodation pick up and drop off in Auckland is included. You can add to this day tour, the full day scenic travel tour to the beautiful Bay of Islands with the famous Cape Brett/Hole cruise or the 3 Day Auckland to Bay of Islands travel tour or choose from a range of half and full day sightseeing attractions and/or other non-escorted independent touring travel packages (ranging from 2 to 4 Days) in and from Auckland.